The Story of Ferdinand was a picture book published in America in 1936, with a story by Munro Leaf and illustrations by Robert Lawson. Amusing and pleasing, it’s the story of a gentle bull, Ferdinand, who loves flowers and sits blissfully among them. When he’s stung by a bee and stampedes, humans mistake Ferdinand for a savage beast and send him to the bullring, but, in the book’s words, he “wouldn’t fight and be fierce no matter what they did.” Finally the humans give up, returning Ferdinand to his happy home. Leaf wrote the story in forty minutes; it’s a few hundred words long, complemented by Lawson’s pictures. It became a worldwide hit. Disney made a very faithful seven-minute cartoon version (Ferdinand the Bull, 1938), which won an Oscar. Now Ferdinand has been desecrated in a terribly misconceived feature-length computer cartoon by the Blue Sky studio, which successfully adapted Charles Schulz to CGI in The Peanuts Movie (2015), but works none of that magic here. 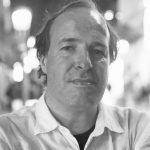 Made by Blue Sky veteran Carlos Saldanha, who co-directed Ice Age (2002) and directed Rio (2011), Ferdinand’s problem is a predictable one. It turns a short, elegant story into a rambling, ungainly one, adding a crowd of surplus characters who can’t lift a hoof to Ferdinand, and dollops of crass comedy and redundant narrative. The first act has the calf Ferdinand fleeing a farm after his bull dad fails to return from the bullring (this is a film where talking animals know all about abattoirs, but still think bulls stand a fighting chance against matadors). Ferdinand ends up in a second, kinder, farm and grows up to huge size with a surrogate family (cute girl, grumpy dog). Then there’s the accident with the bee from the book, at which point he’s sent back to the first farm. After that clumsy opening, Ferdinand still must go through many silly mishaps before the bullring finale, which is itself less funny and pointed than it was in the book. The cartoon wanders from an animal dancing contest, more laboured than funny, to Ferdinand saving other bulls from the mincing machines of the abattoir. The latter scene already felt lazy when Aardman did it with plasticine poultry in 2000’s Chicken Run. At worst, the film feels less like Ferdinand than a cheap Nickelodeon cartoon from 2006, Barnyard (which was memorable for having “male” cows with udders). The characters are weak, with a particularly bad voice/design mismatch for comedian Kate McKinnon, whose voice just sounds wrong from a bucktoothed cartoon goat. The best characters are three Germanic hectoring horses who could have strayed in from DreamWorks’ Madagascar cartoons. There’s also a funny scene where Ferdinand finds himself, inevitably, in a china shop and desperately contorts himself to not break anything, a highlight amid the witless chases and crashes. 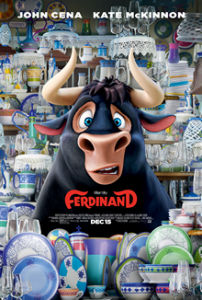 Ferdinand is a weak, tedious cartoon, though it’s likely to be praised by some pundits for its timely message – which is doubly impressive given the film started development six years ago. The original Ferdinand was often read by adults as having political messages, most obviously as a pacifist fable. It’s hard not to see the new cartoon as being an attack on toxic masculinity, with the other bulls mocking Ferdinand mercilessly for his gentleness. Later Ferdinand comforts a bull who won’t admit he’s grieving for a friend, and another who’s had a horn snapped off in a fight. When the broken bull asks bitterly if he’ll have to smell flowers like Ferdinand from now on, Ferdinand tells him no; that’s just how Ferdinand happens to be.